The “AA” division hits the ice starting September 17. If the 20181-19 season is anything like last year, these teams will be worth watching out for. East: The second place Leaside Flames were the only team to get past the dominant North York Knights during the regular season. The two squads battled it out in East final, with the Knights taking the series in eight games. The Knights would go on to defeat the Humber Valley Sharks to claim the title of Scotiabank GTHL Playoff champs. West: It came down to the wire between the Mississauga Jets and Streetsville Tigers as they fought for regular season supremacy. The Jets be crowned GTHL Regular Season Champions, beating out the Tigers by a single point. The post-season would prove to be different with the Jets eliminated by the Humber Valley Sharks in the semi-final. The Sharks and Tigers would meet in the West Final in an eight-game series that resulted in a Sharks victory. East: The North York Knights were able to repeat their regular season success, claiming their second straight GTHL Regular Season Championship in 2017-18. The Knights, however, were not able to repeat the same in the post-season, falling to North Toronto in the second round. The third place Leaside Flames would defeat the Toros in the final to become the new Scotiabank GTHL Playoff champions. 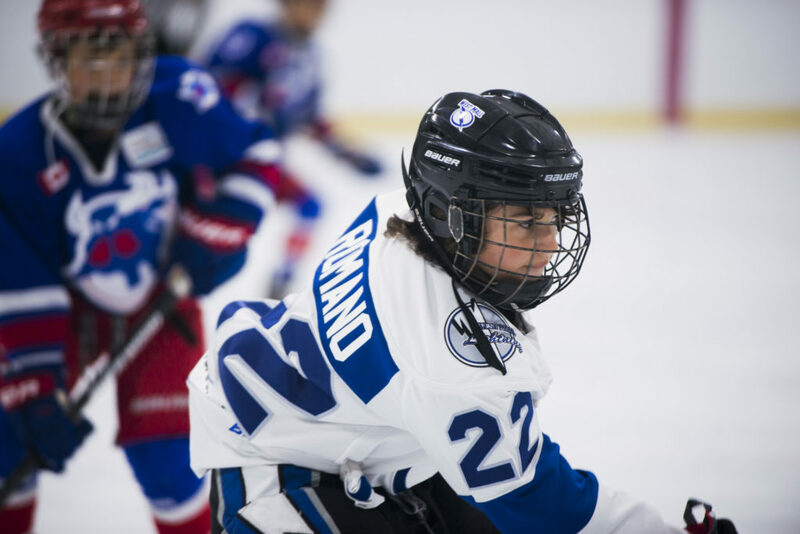 West: In a close battle for first, the Toros were able to repeat their Minor Atom success and remain GTHL Regular Season Champions for the second consecutive season. With their eyes on another Scotiabank GTHL Playoff Championship, the Toros would fall just short, eliminated by the Leaside Flames in six games. East: After winning a GTHL Regular Season Championship in 2016-17, the North York Knights surrendered their title to the Toronto Shamrocks during their Minor Peewee season. The Shamrocks surprise success took them all way to the finals where they fell to the Streetsville Tigers in six games. West: Tied in the regular season standings, the Toronto Eagles and Streetsville Tigers would go to a tie-breaker to determine the GTHL Regular Season Champions. In a 4-1 victory, the Eagles came out victorious. Determined to get back what was lost, the Tigers defeated the Eagles in the West final. The Tigers would go on to become Scotiabank GTHL Playoff Champions after winning their series against the Toronto Shamrocks. East: Dominant at every step of the way, the North York Knights made up for what was lost the previous post-season and captured the 2017-18 Scotiabank GTHL Playoff title. The Knights put on an impressive performance, sweeping two of their series’, including the final against the Vaughan Rangers. West: The Mississauga Terriers were able to inch ahead of the reigning Vaughan Rangers to make the GTHL Regular Season Championship theirs. The Rangers defeated the Terriers in seven games in the West Final. The Rangers would then end up being swept by the North York Knights in the City Final. East: One goal was all it took for the Leaside Flames to clinch the GTHL Regular Season Championship over the Scarborough Young Bruins. The Flames and Bruins would meet again in the East final, with the Bruins coming out on the winning end. After a hard-fought final, the Bruins would lose to the Vaughan Rangers in seven. West: The battle of Vaughan highlighted the West, with the Rangers and Panthers finishing first and second respectively in the regular season standings. The two teams met again in the West final, with the Rangers coming out on top. The Rangers would become Scotiabank GTHL Playoff champions after defeating the Scarborough Young Bruins in seven games. East: The Bantam East division was turned upside down last season, with the former GTHL Regular Season Champions missing out on the playoffs. York Mills were the new kids in town, capturing the GTHL Regular Season Championship and dominating the East division post-season. The squad faced-off against the Vaughan Panthers in the final, falling to the Panthers in seven games. West: It all came down to one game to determine the Bantam West Regular Season Champions. A 4-1 victory by the Vaughan Panthers over the Mississauga Jets confirmed the Panthers as regular season champs. The Panthers winning trend continued into the playoffs where the team defeated York Mills to claim the Scotiabank GTHL Playoff title. East: The North York Knights captured the GTHL Regular Season Championship with ease, but it would take eight games for the Knights to defeat the second place Hillcrest Canadiens in the East final. The Knights fell just short of the Scotiabank GTHL Playoff title in an upset performed by the Mississauga North Stars. West: After winning the GTHL Regular Season Championship, the Streetsville Tigers were upset by the fourth place Mississauga North Stars in the second round. The North Stars captured the Scotiabank GTHL Playoff title, upsetting the North York Knights. Down to eight teams, the top four teams from 2017-18 will all remain. The North York Knights will aim to repeat as both GTHL Regular Season and Scotiabank GTHL Playoff champs, while the Mississauga Jets will look to get back what was lost during the post-season.